Anybody got a forestry scanner link? Been 14 years since I was on the OK Mt Park fire so can't remember the local frequencies. red was one we used to check in and out. Think it was a repeater to Kamloops. Where is the above photo of? Would the smoke be from the Princeton fire? Kevin Skripnek Fire information Officer just said on global news that there has been 45 new fires started today in B.C. Lots of smoke rolling into the valley. Possibly from the Princeton fire? 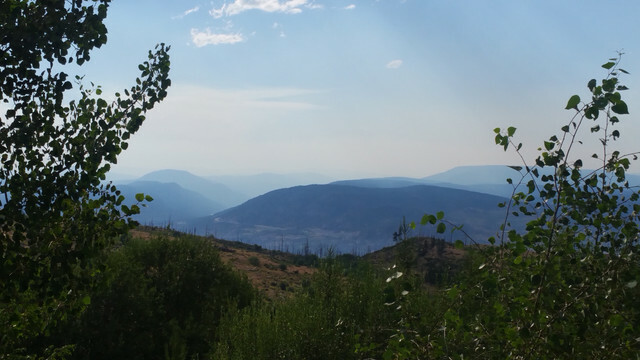 It's really smoky looking south toward Peachland. Wow. Here's map showing all the fires closing highways. Orange triangles are the fires (which were caused by dry lightning, BTW). State of Emergency for BC! Thankful the wind missed us here in the okanagan.